This page is my running diary for 2006. Clicking here will scroll this page so you can see how the year finished. I also keep a blog of writing which is updated approximately weekly. You can leave comments there. I have diaries going back to 1981 and I started running in October 1979. On the track: Run 800 metres in 2:34, 1500 metres in 5:14, 3000 metres in 11:33 and 5000 metres in 19:59. High Jump 1.45m. Others: Finish the '6 foot track' under the 7-hour time limit. Run 60 minutes in the City to Surf. 2 Jan 7.6 Speedygeese. Ran 3 x 900m (approx) loops off 10 minutes: 4:19, 3:55, 3:55 so 4:30/km pace ave. Best I've felt in ages on a Monday. A holiday! 3 Jan 4 After watching the steeple at Interclub (Madeline Heiner ran 9:57), ran out/back to Barry Drive 22:27 (5:36/km). Right heel was sore, PF-like. HJ in 1.25m. 4 Jan 16.8 From PH. First 7.3k lap of Central Basin with Chris and Dennis then another solo. Hot before a cool change. Difficult. Right heel bothersome. 98:32 (5:52/km). 5 Jan 5 Track, Calwell. 2.5k warm-up in 14:58. 23x100m ave 20.7 with 55sec recoveries. Sobering how slow these were - no speed in legs. Cool, track soft. Frees. 6 Jan 6.1 'Steps run' (up). Ran further to make it 6k. Late run, 7.30pm. Took it easy in view of tomorrow's long run. 37:33 (6:09/km). Heel was improved. Tired. 7 Jan 29.5 From Molonglo to Federal Hwy then back via Mt Majura in 3:46:55 (7:42/km). Not good! Walked lots (all of last 10k). Good walking practise I guess. Mild. 8 Jan 7.5 Lap of Calwell from Theodore trail to Calwell shops in 39:23 (5:15/km). Middle was good, ends slow. Kms: 5:58 5:12 4:58 5:03 4:52 4:57 5:55 2:26 (500). Week 01 76k - A good start to the year although long run was a bit sad. 9 Jan 10.3 Speedygeese. Ran warm-up, one circuit and warm-down as I was taking photos. Afterwards a lap of Central Basin LBG. 60:30 (5:52/km). Tired. Warm. 10 Jan 5.1 9pm. Was so, so, close to not running. After Interclub stopped and ran around Central Basin 'hard' clockwise from Comm Bridge in 24:18 (4:46/km). Frees. 11 Jan 16.2 Blessedly cooler; about 20C. Central Basin LBG with Chris, Dennis, Cathy, Bianca at 'easy pace' then again by myself. 87:19 (5:23/km). Felt pretty good. 12 Jan 5.5 Race: Masters' track. High Jump was the only redeeming feature of an otherwise forgettable night: 1500m walk 9:05, 800m 2:55.70, HJ 1.30m, 3000m 14:15. 13 Jan nil Desiring to run better tomorrow than last Saturday I decided to have the day off. I still have a little achilles and calf soreness from last night. 14 Jan 26.8 Molonglo to Fed Hwy, back via Mt Majura. Missed a bit to make it shorter. Hot! Slowed to 6:20 pace near end. 2:58:11 (6:39/km). Cool swim afterwards. 15 Jan nil Inside of my right ankle was sore. Also, I was still feeling yesterday's 3 hour run... I hope I'm not going soft! Week 02 64k - Although bad, I'm glad I ran the 800m race on Thursday. 16 Jan 13.2 Speedygeese. 2k warm-up in rain. 10x382m indoors 'steady'. Legs, esp hamstrings tight. Extra with Chris, Dennis to LBG. Downpour & flooded paths! 72:28 total. 17 Jan nil Was going to run after Interclub. It was raining and after some thought I decided against it, believing an hour of extra sleep to be more beneficial. 18 Jan 8.4 From Parliament House with Chris, Dennis for lap of Central Basin with Cathy's group. Easy pace, hoping to race better tomorrow. 46:23 (5:31/km). Mild. 19 Jan 5.7 Race: 1500m - 6th second heat in 5:47.89. A better run than last week but slow middle 2 laps. 68.6 first 300m, 90.2 last 400m. Mild. High Jump in 1.25m. 20 Jan nil Didn't run, but slept for 2 hours after work... must have been tired. A bit nervous about Steve's planned 35km run around Majura and Ainslie tomorrow. 22 Jan 7.5 Recovery run including a lap of grass track. Amazing that I could run at all after my Virgil Tracy-like walking yesterday afternoon. 44:31 (5:56/km). Week 03 66k - I'm so glad I raced the 1500 metres - good fun! 23 Jan 11.2 Speedygeese. 5x approx 430m hill circuit. Ran steadily. HOT! After, to Lake foreshore with Dennis 4.2k @ 6:10/km. Still feeling Saturday's run. Right heel sore. 24 Jan nil Donated blood so no running today. Haemoglobin up to 141g/L (previously 135 and 132), which was good. Weight up to 78kg (from 75kg), which was bad. 25 Jan nil Didn't feel like going to Masters' track as I was particularly tired after a long day at work. Watched the tennis instead. A-series tomorrow should be good. 26 Jan nil After sleeping in (10 hours sleep), didn't have time to run before riding to the track for the A-series. Good exercise raking the jumps pit all afternoon! 27 Jan nil Didn't run after work as I was driving to Cambewarra and didn't want to fall asleep at the wheel. 28 Jan nil Drive to Bulli - Aunty Helen's Memorial Service. Afternoon tea, 62 Park Rd. Hadn't seen many of the cousins, Uncle Mick, Aunty Jessie for 10 years or more. 29 Jan 31 Diamond Fields Road with Luckylegs. About 4hrs 20mins running (8:23/km). Great company, conversation, location but very difficult running at this pace! Week 04 42k - A poor week but the run with CB was brilliant. 248km last 4 weeks. 30 Jan 13 Speedygeese. HOT! HUMID! 5x800m hill loop east side 'steady' approx 4:15 each. Then to LBG with Griffin and Ruth easy. A blessed cool change blew up! 31 Jan 4.5 Ran 7 laps easy inside fence (615 metres) at the AIS track during Interclub. Legs, feet and everything else felt OK. Siobhan ran a 5:12 1500m relay leg. 1 Feb 7.3 Still 35 degrees at 5.40pm! Just one lap of Central Basin from PH with Chris and Dennis in 40:06 (5:30/km). Felt OK except for the energy sapping heat. 3 Feb nil A rest day prior to tomorrow's long run. Last night my high jump was also bad (1.25m). My 5-lap spiral (2,075m) race walk was OK - 11:48 (5:41/km). 4 Feb 29.2 From Molonglo out/back to Federal Hwy with Steve's 6ft group in 3:03:40 (6:17/km). Much cooler (about 20C). Felt good although slowed in the last 5km. 5 Feb nil Was only planning to run about 4km of warm-up and warm-down. After chatting with John Hunt, joined his high jump session. Hard as stiff from yesterday. Week 05 58k - 1500m was the worst but long run the best for a while. 6 Feb 12 Speedygeese. 5 laps of the 670m west loop off 5 minutes. Ran easily (tired legs). After, a relaxing 4.6k down by the lake with Ruth, Geoff and Peter (6:40/km). 7 Feb 5 'Warm-up' running at Interclub with Kathy (quickish) and later Geoffrey. About 28 minutes. Heels a bit sore especially right, otherwise OK. Cool and windy. 8 Feb 11 3.30pm, 2k warm-up then 1 mile with LL at the AIS in 9:30.2. After, easy lap of Central Basin from PH in 44:58 (6:00/km). Hamstrings tight, heels sore. 9 Feb 5 Calwell. 2.5k warm-up in 14:31. Just watching training, helping Mike. 2.5k warm-down with Kathy in 13:14 (5:18/km). Feet and hamstrings felt better today. 10 Feb nil A rest day. My heels and achilles have settled. I think it may have been the PH uphills on my toes which brought it on. Have had the dreaded PF before. 11 Feb 40 Summit Mt Majura with Chris and Zel. After 20k I walked Mt Ainslie then decided to see if I could do 40k. 5:28:30 (8:12/km). S&V chips, Pepsi at Acton. 12 Feb 5 To Calwell shops on the bikepath, back via Melrose creek in 30:11 (6:02/km). Steady easy run. Not much energy! Legs tired. Right calf a little sore. Week 06 78k - Saturday gave me confidence about finishing 6ft track. 13 Feb 13.9 Speedygeese. Ran easily behind the group who were doing 40sec sprints. Warm-down with Peter next to the lake. Total 1:26:01 (6:11/km). Warm then cool. 14 Feb 3.2 Race: 3000m Walk at Interclub in 16:49.61 (5:36/km). Faded after 2 laps. Km splits: 5:26, 5:39, 5:44. Warm, breezy. Bad HJ in 1.25m. Kathy a 5:04 1500m! 15 Feb 9.4 From PH to Comm Park via Kings Ave, with Chris, Dennis, Shaun and Niki. Back via Lennox Gdns in 53:12 (5:40/km). Felt OK. Feet good. Holding back. 16 Feb 2.3 Race: Masters: 2000m H'cap Walk in 10:47 (5:24/km), OK. Luckylegs ran a fantastic mile in 9:06.88 (less than 8 seconds off the W75 world record)! 17 Feb 6.5 Intervals, Melrose River. 6x500m 'solid' in 2:17 ave with 500m recoveries in 3:10. First intervals longer than 100m for ages was a shock to the system. 18 Feb 28.9 Summit of Rob Roy (1104m) and 'more' with Steve Appleby's 6ft group. Very hilly. Walked last 12k. 4:29:33 (9:20/km, 7hr 6ft pace). Hot. Dehydrated. 19 Feb nil Just an easy mountain bike ride in the late afternoon down to the Calwell shops. Week 07 64k - Thursday was memorable. Saturday was difficult. 20 Feb 14.3 Speedygeese. 12 x 40 second sprints (ran moderately). Afterwards, 6.1k to the lake with Gary at 5:38/km in a fresh cooling breeze. Body tired, feet good. 21 Feb 6 Track, Calwell. 2.5k warm-up in 14:48. A number of drill/form runs over 50 metres. Legs still pretty tired. 2.5k warm-down with Declan, Kathy in 13:58. 22 Feb 11.9 From PH over Comm Bridge (very windy), then with Cathy and friend around the lake. Last 2k quick (5:09s). Back via Lennox Gdns. 66:50 (5:37/km). OK.
23 Feb 5.6 Track, Calwell. 2.5k warm-up 15:17. Tired, no energy, legs not working. 3.1k warm-down (2 laps ovals) with Kathy in 16:40 - this wasn't easy. Stormy. 24 Feb nil Considering how tired I was yesterday I decided not to do the planned 400m intervals and rest for tomorrow's long run - the last prior the Six Foot. 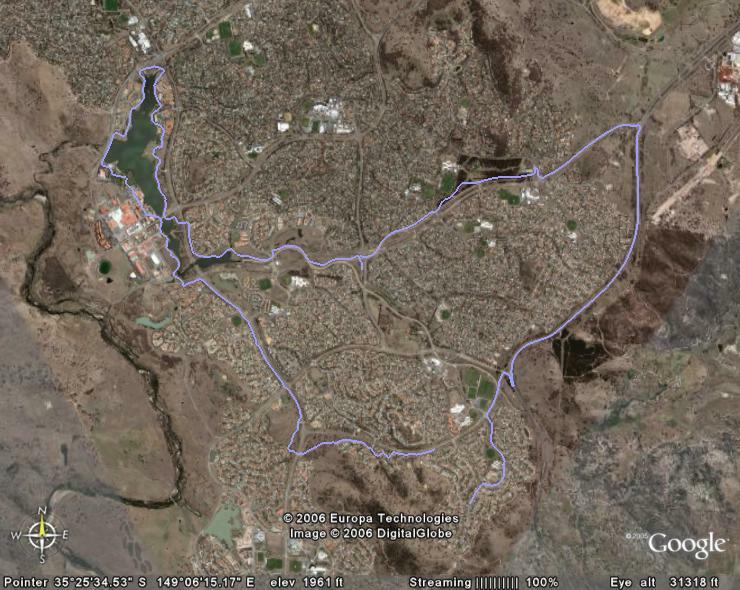 25 Feb 28.3 Last long run with Steve's 6fters to Majura 4-ways, back via Mt Ainslie to LBG in 3:19:27 (7:03/km). Felt OK, only 3k or so walking. Hot but plenty of water. 26 Feb nil This was going to be a short run day. Slept in, then rode out to the track. Once home, I had a few things to do on the computer. Should have run first. Week 08 66k - Long run OK. The rest average. 266km last 4 weeks. 27 Feb 12 Speedygeese. 8 x 80 second 'sprints' every 4 minutes. Ran easily at the back. Afterwards a pleasant 3km extra down to the lake with Ruth and Caroline. 28 Feb 2 Rode the Kosciusko to Calwell after a long day at work. Tired, sluggish during my 2k warm-up so just watched training... small improvements for S.
1 Mar 10 Intervals, bikepath. 3 x 2km in 9:12, 9:11, 10:00, with 800m jog recovery in 5:10. Felt good. To Isabella Plains and return (headwind). 54:50 running. 2 Mar 3.5 Calwell. Ran 5 laps for a warm-up. Some good 'leg drills' to practise the best movement for middle distance running. A lap of the ovals for a warm-down. 3 Mar 8.4 Intervals. On flatter tracks/paths. 8 x 400m - 1:47 1:46 1:42 1:52 1:49 1:49 1:42 1:57. 400m jog recov in 2:45. Felt sluggish. 4:30/km pace. 48:24 total. 4 Mar 19.5 Molonglo to Pines, back south side of Ainslie in 1:55:52 (5:56/km). Struggled behind Steve's pack of 6 ft runners. Legs tired from last night's intervals? 5 Mar nil A scheduled rest day. After 6 foot this will be a normal running day. Week 09 55k - Some good fast sessions. One week to 6ft track. 6 Mar 13.2 Speedygeese. 2-person 'steps relay' near rose garden. 12x260m, 130m jog recovery. Ran with Neil fairly hard. After, easy to LBG with Ruth, Geoff & Gary. 7 Mar nil A planned rest day. Rode the Kosciusko to Calwell (some good running by the kids). After to the shops and home. Strangely, the legs felt pretty good. 8 Mar 10 From Parly House with Chris - met Catherine after Kings Ave Bridge. Legs ordinary at first, but improved. All excited about 6 foot. 56:20 (5:38/km). 9 Mar nil Another rest day. Rode the Kosciusko to Calwell and the shops. Legs are feeling pretty good. Just hoping for two nights of good sleep. Hot! 10 Mar nil Rest day. Drive to Katoomba via Mittagong with Steve. 11 Mar 45 Race: Six Foot Track. 675th in 6:56:09 (9:15/km). Hard. Ran too fast to the Cox's River (1:40). Pluvi in 3:35. Blew up on the Black Range. Hot. 12 Mar nil A short walk with Steve, Geoff and Elizabeth to see our relations (The Three Sisters)... a long drive to Canberra via Mittagong. Hotter than yesterday! Week 10 68k - A very different and difficult 6ft track. 13 Mar nil Quads quite tender. Thankfully, no other injury problems or blisters. 14 Mar nil Legs still sore but less so than yesterday. Rode the mountain bike on the fire trail and to Calwell for about 7k total. Hot then a cool change. 15 Mar 7.6 With Chris from PH to Lake Burley G via Kings Ave. Met Nicki and ran back via Comm Bridge. 44:03 (5:48/km). Right calf sore! Cool and breezy. 16 Mar nil Calf seemed better today. Quads are pretty much pain free. Cycled down to Calwell. I'll probably do another easy run with the group on Saturday morning. 17 Mar nil Calf OK walking. Planning an easy jog with a few of the Six Foot survivors tomorrow morning. Keen to commence my new training. Cold, then beautiful. 18 Mar 11.8 Easy run 8am Molonglo to lower slopes of Mt Ainslie with Zel, John, Chris, Maryann, Barbara, Mike in 68:44 (5:49/km). Felt pretty good. No problems. 19 Mar 8 The day of Kerryn McCann's emotional marathon win. 1k warm-up/down. 2 laps of a 3k course around Calwell in 29:50 (4:58/km). Slowed. 14:17/15:33. Week 11 27k - Recovery going well. Need another easy week. 20 Mar 7.7 Speedygeese. 2 lap warm-up. 8 x 290m lap of lower grass square. Ran fairly quick on some, just behind Maureen. Didn't feel great. Cool and breezy. 21 Mar nil A rest day - fortuitous as work busy. Cycled to Calwell, helped Meg and Alex with forwards/backwards drills. Cool in the late afternoon. Summer over? 22 Mar 9.7 Steady run with Chris from PH - Comm Bridge then Central Basin long in 52:51 (5:27/km). Didn't feel too bad. Energy better. A great sunset. Mild. 23 Mar nil Didn't have time to run after work before heading out to the track (rostered to help). Saw some good racing from members of Team Moore. Cooler. 24 Mar 6 Intervals. 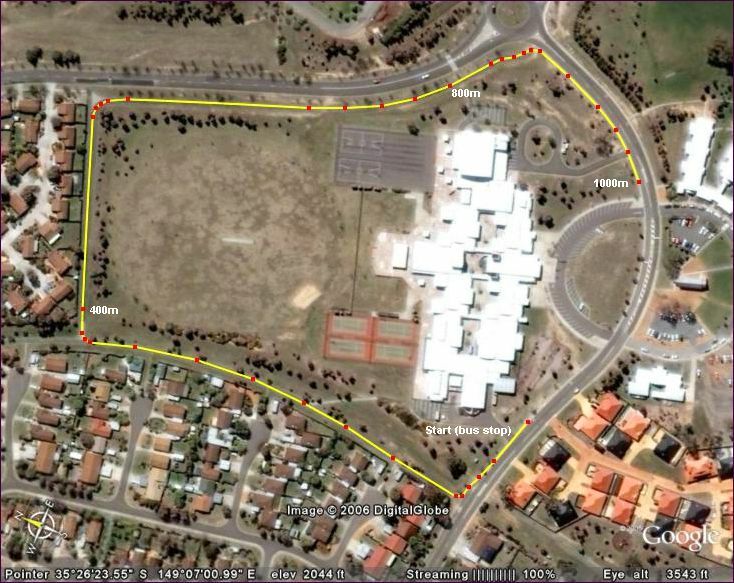 Testing a bikepath/footpath course around Calwell High. 3 x 1000m - 4:15, 4:12, 4:17, (3min walk recov). A struggle for speed. Breezy. 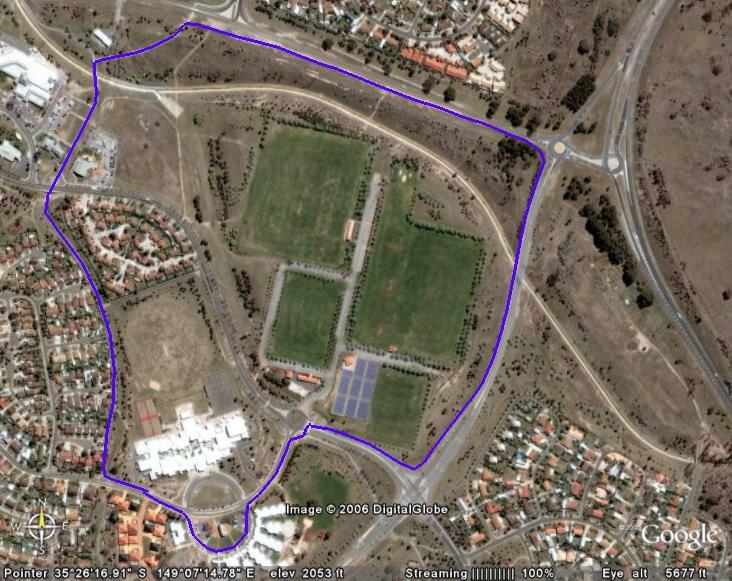 25 Mar 9.9 Lap of East Basin LBG from Molonglo with Maryann in 57:45 (5:50/km). An enjoyable easy run. Drizzle, overcast cleared to a sunny morning. Warm. 26 Mar 10 1km warm-up. 9k in 45:42 (5:05/km), 3 laps of a 3km 'fairly flat' course aiming for 'even pace'- 15:19, 15:17, 15:06. Felt OK although not easy. Mild. Week 12 43k - Starting to feel normal again. 193km last 4 weeks. 27 Mar 10 Speedygeese. 2 laps then 5 x 855m laps of grass at front. One lap plus 'a bit' after. Felt surprisingly good for a Monday (no weekend long run?) Warm. 28 Mar 4 Calwell track. Short warm-up 8 minutes on grass. Helped TH with drills. 2.5k warm-down with Kathy in 13:20. Legs felt good. Windy and cool later. 29 Mar 10.5 From PH with Chris - then a lap of Central Basin LBG with Nicki in 56:36 (5:23/km). Felt very easy which was pleasing. Mild. Another great sunset. 30 Mar nil Outside of left leg above ankle a little sore. Decided not to run. Brought new Mizuno shoes instead. Light rain most of the afternoon and cooler. 31 Mar 6 Intervals - Calwell High. 3 x 1000m - 4:13, 4:07, 4:06, (2:52 walk recov). An improvement on the same session as last Friday. Breathing good, no speed. 1 Apr 16.5 Molonglo - slow early then a quicker middle with Chris. 95:30 (5:47/km). A bit long! Ran to War Memorial then back near lake. Cool, stormy and windy. 2 Apr 10.5 1.5k warm-up. 9k in 45:07 (5:01/km). 3 laps of my fairly flat Calwell course in 15:17, 14:53, 14:57. Hard to get going. Working to keep pace. Cool. Week 13 57k - Pleased with the 1k intervals. Feeling 'over' 6 foot. 3 Apr 7 Speedygeese. Warm-up then 3 x 900m around paths on west side. Full recovery. Ran easily at the back. Strode out a bit in the last one. Legs felt good. 4 Apr 5 Calwell, 2k warm-up 11:20. Some quicker runs on infield timing Siobhan's 100m splits. 2.5k warm-down with Kathy in 12:54. A warm, breezy afternoon. 5 Apr 10.4 From PH with Chris - a lap of Central Basin and back via Lennox Gdns in 56:22 (5:25/km). Pace comfortable. Felt good. A very gusty westerly wind. 6 Apr 1.5 Calwell. Arrived late and just did some short runs. Not a great afternoon - very cold and windy, snow on the Brindys. Hoping the weekend is better. 7 Apr nil Rest day. A bit of housework before driving to Rydges then to Civic with LL for dinner and back to the hotel for a cuppa. 8 Apr 8.5 An easy run with Bruce (6:12/km) from Telopea Park to Kingston foreshore and the wetlands before watching the Marathon Eve 5 and 10k fun runs. 9 Apr 27 Running to different parts of the marathon course following the progress of LL and Horrie. About 3hrs 15mins. Didn't mean to run this far! Sore legs. Week 14 59k - A special marathon weekend in many ways. 10 Apr 7 Speedygeese. 2 lap warm-up. 4 x 375m laps on lower grass square, full recovery. Ran quick on the last three. Felt surprisingly good. Not cold at all. 11 Apr 5.3 Track, Calwell. 1.6k warm-up. 2000m in 9:16 (4:41, 4:35). Drills. 1.6k warm-down. Felt good in the 2k - an idea to start quicker next time. Warm. 12 Apr 9.7 Around Central Basin from PH with Chris in 54:09 (5:35/km). Very easy. Except for a slightly sore left knee, felt good. Full moon. Warm and windy. 13 Apr 5 Track, Calwell. 1.6k warm-up/down. 5 x 300m in 72.5, 69.6, 67.5, 66.1, 66.0. Ave speed was 3:48/km pace so at least that's something quicker. Mild. 14 Apr nil Driving to Wagga for Easter. Had quite a sore throat. 15 Apr nil Throat worse! Very sore, along with a nasty cough. 16 Apr nil Sore throat has turned into a head cold. Week 15 27k - Week finished poorly with a cold. Wagga good though. 17 Apr nil Still too sick to think about running. Maybe a light jog tomorrow? This has been one of my worst colds ever. An early night beckons. 18 Apr nil A little less sick than a dead dog lying in a ditch. Another early night. 19 Apr nil Again didn't run. Blogged instead. Another 11 hour sleep last night. Second day off work. Feeling a bit better. 20 Apr 2.5 Calwell track. Ran the long warm-up by myself in 13:59. Awkward at first before moving well. Quite a sweat going. Chest and throat sore. 21 Apr nil I decided not to run as my cold has been hanging around like a lost puppy. It's been a good one. Very faithful. Cool and windy. 22 Apr 9 About 60 minutes of warm-up and warm-down runs with the kids for the LA Aus Teams Championships around a 'new' Eucalypt Trail. A glorious day! 23 Apr 9.2 9AM, easy run with Ben from Calwell through Melrose pines and along Cooma railway in 54:20 (5:54/km). Struggled with breathing. Top weather. Week 16 21k - Didn't enjoy having a cold. 164km last 4 weeks. 24 Apr 8.7 Speedygeese. One lap of down/up every grass hill. Very ordinary... couldn't breathe, legs not working. Struggled at back of the pack. Cool. 25 Apr nil Slept 11 hours. Cold still hanging around. Helped out timing ten SCT teams at the Anzac Relays. Rode Mizuki (the GSX 1400). A spectacular day. 26 Apr nil Giving the cold another day. Such a shame as it was another perfect Autumn afternoon, designed especially for running, not sitting at a computer! 27 Apr 7.3 An easy run from Calwell with some of the kids on dirt beside highway to the bmx track opposite Gilmore in 40:24 (5:32/km). OK but still have cold. 28 Apr nil Slept in, arrived at work 3 hours late... I think my cold is telling me something! Did not run. Want to try the short cross country race tomorrow. 29 Apr 5.9 Race: Red Hill 3.7k CC. 27th in 17:16 (4:40/km). Still feeling the effects of my cold. Have also lost fitness! Mild. Sticky mud = heavy going. 30 Apr 9.8 1.3k slow. 8.5k from Calwell with Ben, Siobhan & Courtney, via pines up past Tuggeranong Railway Station, back in 47:06 (5:32/km). Cold improved. Week 17 32k - The race was bad but my cold is getting better. 1 May nil Was planning to go to PH (probably a carpark indoor session). It was raining so I decided to keep the remains of my cold nice and warm at home. 2 May 9.6 Track, Calwell. Past tunnel to Gilmore, back in 34:21 (5:27/km). 4x200m with Karen in 48, 45, 47, 46 trying for good form. 2.5k with K & K in 16:15. 3 May 6.7 From PH around Central Basin in 36:33 (5:27/km). 3k steady, 2k hard (4:43, 4:41), 1.7k easy. Both hamstrings, left ankle a bit sore. Very windy! 4 May nil Drove to and from Bulli via Nowra for Aunty Doff's memorial service: Dorothy Ouita Thompson 31 May 1915 - 1 May 2006. Saw a wombat on way home. 5 May nil Tired after a long day at work and not enough sleep. Sat at the computer and caught up with blogs. 6 May 7.5 Race: Cooleman Ridge 5k CC. 23rd in 24:38 (4:56/km). Felt better this week. Splits 12:20/12:13. Really a fade as the first half is uphill. Tough course! 7 May 11.3 Race: The Nail Can Hill Run. 262nd in 60:56 (5:24/km). Walked steep ups, strode out on flats, easy last downhill. Wet, cool, windy & muddy! Felt good. Week 18 35k - Nail Can was a fun day! Good to meet Gronk- ! 8 May 7.4 Day 8: (of the 5k plan) Speedygeese. 46mins at 6:15/km including 10 x '100m' on grass 'fast' with good form. Felt smooth, easy. Left ankle sore. Cold. 9 May 4.4 Day 9: Calwell. 1.6k warm-up. 6 x 200m at '800m race pace': 44, 43, 42, 42, 43, 43. Full recovery. Drills, 1.6k. Did Day 7 by mistake! Cold, windy. 10 May 8.4 Day 10: Recovery. With Chris around Central Basin slow in 51:40 (6:09/km). Didn't do downhill 100s after as both hamstrings sore since Monday. Cool. 11 May 7.1 Day 11: Calwell. 1.6k warm-up. 3 x 1000m at '3000m pace': 4:19, 4:15, 4:16. 3mins walk recovery. Heart, lungs not happy but I was! 2.5k in 14:07. Mild. 12 May nil Day 12: Rest. A planned rest day. I still felt slightly lazy as it was a perfect afternoon for a run. Sat at the computer and read blogs. Sunny, still. 13 May 7 Day 13: Race: HM Eve 5k road. 46th in 22:30 (4:30/km). Chasing Eliza. 'Flat out'. Didn't feel great. Splits: 4:16, 4:30, 4:37, 4:40, 4:27. Warm, still. 14 May 8 Day 14: Out and back to Conder via bush track easy in 49:42 (6:13/km). Average HR 140 (85%). No 100s as legs sore. Drills Calwell. Mild, sunny, dry. Week 19 42k - The 5k race shows I have a lot of work to do. 15 May 10.4 Day 1: Ran 9k in 45:11 (5:01/km). Laps of 14:57, 15:05, 15:09. Ave HR 147 (89%). Pushing fairly hard. Slightly slower than last time. Tired. Mild. 16 May 7.1 Day 2: Recovery 44:33 (6:18/km). Calwell, warm-up with Karen. 20 mins of drills. Easy laps on track + warm-down. Ave HR 127 (77%). Mild and dry. 17 May 8 Day 3: 7k in 35:09 (5:01/km). Melrose River, Tugg Homestead. Out of time, so a bit short. Outside left hamstring bothersome. Ave HR 149. Cool. 18 May 7.8 Day 4: Recovery. Calwell. 2.5k warm-up 15:40. Drills. About 6 laps in outer lanes with Karen incl 3 x 50m sprints per lap (HR 137). Ave HR 125. Mild. 19 May nil Day 5: Missed an important session. Was to do 3 x 2000m. Have had some ankle soreness the last 2 days. Also quite tired after a long day. Mild, dry. 20 May 6.4 Easy run with Bruce through Domain and past Opera House. 38:45 (6:03/km). Felt OK although left hamstring was a bit dodgy. Saw seven weddings. 21 May 21.1 Race: SMH Half Marathon. 2:26:25 (6:56/km). 0-7k 51:59. 7-13k 28:27 (4:45/km). 13-21k 65:58. Fast bit felt good. Great run from Luckylegs! Warm, sunny. Week 20 61k - Sydney brilliant. Very happy! 170km last 4 weeks. 22 May 6.5 Speedygeese. A recovery day. 1.8k warm-up then 6 x 560m east hill circuit very easily including some walking. Legs felt surprisingly good. Cold, dry. 23 May 1.6 Calwell. Recovery. Short warm-up followed by easy sets of standing drills. Legs fine. Back to the program tomorrow. Very cold and bleak. Good sunset! 24 May 10.3 Day 10: Recovery. From PH with Chris, Cathy around Central Basin 59:45 (5:48/km). Didn't do the 100s. Want to get hard days going well first. Cool. 25 May 6.3 Day 11: Calwell. 2.5k warm-up 15:20. Drills. 3 x 1000m at 3000m pace: 4:16, 4:20, 4:22. Max HR 163. Walk interval 2:55. 800m warm-down. Tired. Cool. 26 May nil Day 12: A planned rest day! Fortuitous as it was a tiring day at work. Racing a 6k cross country race tomorrow which will be interesting. Mild, dry. 27 May 8.9 Day 13: Race: Carillon 6.45k cross country. 41st in 30:29 (4:44/km). Laps: 10:03, 10:18, 10:11. Felt OK. Ave HR 154 (93%) Max HR 158. Warm, dry. 28 May 12.4 Day 14: Back from Melrose Pines with kids. Easy 4km Calwell track, Ave HR 133 (81%) 22:21 (5:35/km). Long warm-down with Kathy. Warm, dry! Week 21 46k - A pretty good week. Fairly happy with the race. 29 May 8 Day 1: Scheduled to run a 'hard' 9k but both hamstrings a felt tight. Went to PH and did the hill session easily as a steady run in 48 minutes. Cold. 30 May 4.9 Day 2: Calwell track. 2.5k warm-up. Lots of drills. 4 x 200m 'strong' with Kate and Karen - 43.5, 39.7, 38.0, 38.2. Walk back recov. Frees. Cold. 31 May 9.7 Day 3: With Chris, PH around Central Basin in 54:55 (5:40/km). This was supposed to be faster but I couldn't get out of struggle mode tonight. Cold. 3 Jun nil Collected rental car from airport and left for Sydney at 1pm. Staying at Stamford Plaza near the airport. Met Bruce for dinner. 4 Jun 5 At the Candy Cane Inn - Anaheim. About 6pm after flying from Sydney via Auckland. 3.1 miles on treadmill in 28:26. Average HR 138. Pretty boring. Warm. Week 22 28k - Training plan is on hold until I'm back! 5 Jun nil First day at Disneyland included 4 rides on the 'cup and saucer'. Didn't fall down. Good fun! Loved the parade and fireworks show in the evening. 6 Jun nil Second day at Disneyland. Managed to do most of the rides/shows we hadn't done yesterday plus a few at the adjacent park 'California'. Lots of walking but no running. 7 Jun nil Moved by limo to our new hotel at Beverly Hills. Bus to Santa Monica beach. Spent the afternoon walking around the suburb trying not to get run over by Bentleys, Ferraris and boring old Mercedes and BMWs. 8 Jun nil The whole day at Universal Studios - highly recommend it. The back lot tour and Waterworld show probably the highlights. No running. Warm, sunny. 9 Jun nil Traveled on local buses and underground to Hollywoood. Managed to do 2 bus tours. Saw the Hollywood sign. A great day. Saw some runners but didn't run. Warm, dry. 10 Jun 5 5.45am! Ran up Rodeo Drive to the park and then around the suburb of Beverly Hills. 26:59. AHR 140. Frees. Not fit! Warm. 11 Jun nil Vancouver. Breakfast at Teresa's - beautiful. Shopping at Sears. Weather near perfect - 20C and sunny. Week 23 5k - Not a great week for running but who cares?! 13 Jun nil A walk in Stanley Park to Beaver Lake and back via Lost Lagoon. Saw a racoon! Walked uptown and saw 'The Break-Up' & 'Posiedon'. Still twilight at 10pm. Warm. Light morning rain. 14 Jun 8 6pm. 'Running Room' shop group run - Stanley Park, with faster 10k group (about 10 runners). Mainly with Taliesa (sp? ), a woman from New York. Around Lost Lagoon to stone bridge, on gravel trails past Hollow Tree to Prospect Point (regroup). Back on Bridal Trail to swimming pool then left along Seawall. Was to be a 10k run - stopped early as I was struggling to keep up. 41:20 (5:12/km) AHR 148. Hard! Mainly breathing on uphills. Mild, cloudy. 15 Jun 7 Portland, Oregon 8pm. recovery run along Willamette River - out/back in 39:17 (5:36/km). AHR 138. Legs really feeling Yesterday's run. Warm. 16 Jun nil Hired car in Portland (a near new Ford Taurus) - drove down Interstate 5 to Kings Valley. Pizza and beer with Joe, Deb and family. Warm. 17 Jun nil Drove to Silver Falls state park for a hike and picnic. Saw 4 of the spectacular water falls and hiked about 5k. BBQ Prawns, beer. Perfect weather! 18 Jun nil Slept in. Watched Aus vrs Brazil (0-2) World Cup soccer 9.30am. Cleaned up after the sink leaked. Drove to Corvalis - visited Don & Joyce. Browsed the local shops. Take-out from Tarntip Thai near OSU. Mild, cloudy. Week 24 21k - Enjoyed the Stanley Park run! 100km last 4 weeks. 19 Jun nil Drove from Joe & Deb's to Crater Lake. Breathtakingly spectacular - you had to be there! A huge amount of deep snow still on the mountains (road just opened). They had 571 inches of snow this past season. Stayed at Mazama Village Inn. All trails under snow. Beer, wine & pasta at Annie Creek Restaurant. Warm, sunny, clear blue sky. 20 Jun 10.3 7am. Ran to campground then on main road towards Crater Lake (didn't see any bears). A sparkling morning! Very slow and creaky early. 5.8k in 32:09 (5:32/km) - splits 5:49, 5:38, 5:23, 4:57. Alt 1840m. Cool, clear. 8pm. Ashland, Oregon. After dinner at Greenleaf Restaurant - exploring this charming city. Ran both sides of the bear creek and through Lithia Park. Lots of pollen in the air. AHR 137. Alt 535m. Warm, clear. 21 Jun nil A long driving day - left Ashland 8.10am via Grants Pass to Crescent City on the far north Californian coast. Through the big, dark Redwood National Park to Eureka. Drove through the giant redwood tree 'Chandelier' at Leggett, then on a very long switchback road over mountains to Fort Bragg arriving 7pm. 22 Jun 7.7 San Francisco. From Sea Side B&B 6.45pm down 43rd to Fulton St, up Golden Gate Park, left on 9th Ave to Richmond Library, back on Geary Boulevard. Rough at first, reasonable middle with good form. 43:23 (5:36/km), AHR 143. Cool sea breeze. Clear then foggy. 23 Jun nil San Francisco. Big day sightseeing. All public transport free (clean air day). Ferry tour of bay; cable car ride up/down California St; Chinatown (Grant Ave); bus to Pier 39; walk back to Market St; Vietnamese dinner on Geary Blvd - home 9.30pm. Warm, sunny midday, cool windy fog later (Golden Gate Bridge obscured). 24 Jun 7 San Francisco 8.30pm. Ran to the old ocean pool and along beach (tide in). A dozen or more fires burning on the sand. Got slightly lost in Golden Gate Park - a bit spooky as I was the only person and the misty fog was heavy (ran fast). Stopped at 7.01k - half way up 43rd Ave. 39:53 (5:42/km). Felt good. Cool, misty. 25 Jun nil Drive from San Francisco to Penon Blanco B & B near Yosemite National Park. Dinner at the Hotel Jeffery (oldest operating hotel in California - est 1851). Back 'home' to enjoy the views of the lake from our balcony. Week 25 25k - You must see Crater Lake with snow... amazing! 26 Jun 6 Lone Pine. A flat out and back on Main St (Hwy 395) with a great sunset view of the snow capped Sierra Nevada Mountains and Mt. Whitney (14,505ft) on my left. 32:10 (5:22/km) AHR 146, ALT 1135m. Felt OK although tired. A fantastic day at Yosemite and driving over Tioga Pass - 9,994ft ALT. Lots of snow. Very warm. 27 Jun nil Drive through Death Valley to Las Vegas. Fascinating scenery. Lowest point on hwy, 242ft below sea level (Forerunner Man said minus 82m). Temp at Stovepipe Wells was 47 degrees C in the shade. Cooler at Vegas - 106C. 28 Jun nil A big day walking around the strip. Saw 2 shows - 'Nathan Burton' (comedy magician) and 'Legends in Concert' at the Imperial Palace. Sunny, very hot! 29 Jun nil Slept in. Walked up to look and shop at the Excalibur, Luxor and Mandalay Bay Casinos. Dinner at the Spice Market Buffet (voted #1 in Vegas). More shopping then 10pm show at the Bellagio - Cirque Du Soliel. Hot! Still 90s at midnight. 30 Jun 4.5 Page, Arizona (near Lake Powell). Out/back from Best Western to High School - 4.5k in 26:33 (5:54/km) ALT 1335m. Didn't feel good after a lovely dinner and local beers at the Dam Bar & Grille. Drove today from Vegas into Utah and Arizona - brilliant rocky desert scenery. Hot. Brief thunderstorm. 1 Jul nil Drove 120 miles to the Grand Canyon National Park. Arrived at first viewing area 'The Watchtower' in rain - cleared after an early lunch. ALT 7,522 feet (highest point on south rim). Saw a bull elk on our drive to the village! A couple of stops on the way to take many photos of the Canyon. Left 5pm after one short hike. Difficult finding accommodation in Flagstaff (successful on 8th attempt at 7.30pm but no hair-dryer for Joy). A good meal and atmosphere at Maloney's Irish Pub - Fat Tyre beer was good! Warm. 2 Jul nil Didn't run - too late back from dinner. 113 degrees F. Drove from Flagstaff Arizona (6,000ft ALT) to Blythe, just over the border in California. (9.15am to 5pm). Amazing changes of scenery. Fantastic rock formations near Sedona to flat cactus desert east of Blythe. Week 26 10.5k - Death Valley, Vegas and The Grand Canyon. Wow! 3 Jul 7.2 Drove from Blythe to San Diego arriving 4pm. Most stunning sights were the Imperial Desert (sand dunes) and the boulder covered hills west of El Centro. 9.30pm. Ran from The Town Inn out/back to the Airport. At one point got stuck on wrong side of freeway fence. Didn't enjoy running on concrete paths and a full stomach (The best ever Mexican food at 'The Jolly Boy' in Old Town). 7.2k in 39:52 (5:30/km) ALT 16m. Splits: 5.57, 5.43, 5.22, 5.21, 5.10, 5.14, 5.42. Warm, humid. 4 Jul 6.3 San Diego 6.30pm. Ran from Old Town Trolley stop uphill through Presidio Park (6m ALT to 84m) to a residential area of stately homes. Great views to the west. Felt OK. Frees, 34:38 (5:33/km). Warm. A sea breeze. 5 Jul 5.5 6pm. San Diego. An easy run through Old Town following bike route to top of the hill. Breathing was a bit ragged although AHR at 138 was low. 31:23 (5:42/km). Our last evening meal at 'The Jolly Boy' as there was a queue at the other suggested Mexican. Warm. 6 Jul nil Left San Diego 11.10am arriving at LAX 6.15pm [flight left at 11.45pm]. A generally leisurely drive up the coast (Historic Hwy 101) although brief periods on Interestate 5 were exciting with many lane changes at 75mph (speed "limit" was 65). Stopped at San Clemente and Manhattan beaches. Mild (86F), sunny. 7 Jul nil No Friday - flew back over the International Date Line. 8 Jul nil Arrived Sydney 10.30am on Air NZ103 after a 2 hour stop at Auckland Airport (3hrs 30 from NZ and 12hrs from the US to Auckland). A coffee upstairs with Bruce then hired car for the drive to Canberra leaving about 12.30. Strange sitting on 'wrong' side of car with no steering wheel. Arrived Canberra 4pm and finally at my place about 5.30. Very tired!! A fantastic holiday! Would do it again. Loved it! Cool, sunny. 9 Jul nil A rest day! Downloaded my photos from the trip. There were 1,723 of them. Some of them are good. Joy and Mal probably took another 1000 or so. Cool, sunny. Week 27 19k - Despite being unfit I enjoyed my runs in San Diego. 10 Jul nil Tired after a fairly long day at work. I'd rather be on holidays. Struggled to stay awake during our club meeting even though it was only 9pm. Cold. 11 Jul nil Another long day. Tired. Would have been silly to run feeling like this. Very cold, windy. Late rain. 12 Jul nil A visit to the dentist after work for x-rays and a small filling on an 'upper rhs back tooth'. Didn't feel like running. Cold, sunny. 13 Jul nil Not a goof day! I guess all this overtime will help pay for my next overseas holiday. Trouble is, I'll be too unfit to run! Cold. 14 Jul nil Tired. Obviously this week has been a write-off as far as my running is concerned. I plan to start again on the weekend. Cold. 15 Jul nil Did not run! It was a miserable day - pretty much rained all day (which we need desperately because of the drought) and it was cold. Tomorrow? 16 Jul 5 2.30pm. Down beside 'Melrose River', back via Calwell shops. Legs felt as old as the Grand Canyon. 28:02 (5:36/km). Ave HR 157 (95% of maximum), higher than Carillon race pace! Max HR 162. Splits: 5:11, 5:23, 5:34, 5:48, 6:06. Saw Courtney running and walking with Rommel the Shepherd. Cool, damp. Week 28 5k - Bad. Missing the 110° of Las Vegas. 60km last 4 weeks. 17 Jul 8.7 Speedygeese. Tired and legs a bit sore after yesterday. A group hill session (19 x 98.5m with jog down) which I did as easily as possible. Right hamstring started to get sore. Cool, damp. 18 Jul nil Went down to Calwell but didn't run. Right hamstring still sore (very strange as it's usually the left one that plays up). Cold, damp, windy. 19 Jul nil Hamstring has improved with rest. Obviously did too much on Monday after the hard run on Sunday. Went for a short walk. Cold, sunny, windy. 20 Jul 5.5 Calwell. 2.5k warm-up with Karen in 15:35. Drills. 3000m on track - evenly, trying to keep HR under 150. Time 16:11 (5:24/km) at 152 ave HR 92%. Hamstring and legs felt good. Happy. Cold, windy, snowy clouds. 21 Jul nil A rest day. Heading down to Cambewarra in the morning for a family gathering. Cold, windy, overcast. 22 Jul nil An early 5k walk before driving to Cambewarra. Went to the park at Huskisson on Jervis Bay. Saw dolphins swimming just off the beach. Mild, dry. 23 Jul nil Left for home 12.20pm via Mittagong. A session with CB at Iron Mine Oval before visiting a great coffee shop in the main street. Mild, sunny, then cloudy and rainy. Week 29 14k - The session at Calwell was good. Fitness is down. 24 Jul 8 Speedygeese. In the underground carpark. Many laps for warm-up/down. 20 x straight hills (about 90m). Ran moderately hard in second set of 10. Legs felt OK. Cool, rain! 25 Jul 5.7 Calwell. The track was water-logged! 4 repeats of a circuit west of the track including the hill. Also, 2k on straight track of 100 'strong', 100 jog. Mild, still. 26 Jul 9.8 From PH with Chris, Central Basin LBG and back via Lennox Gardens. Steady - 56:29 (5:46/km) Ave HR 141 (85%). Legs OK, breathing not. Cool, dry, still. 27 Jul 4.6 Calwell. 1.7k warm-up with Josh, Alex in 9:31. 4 x 750m circuit incl hill - 3:55 3:44 3:49 3:47. Max HRs 152, 155, 158, 159 (96%). Wet grass. Cool, still. 28 Jul nil Felt like I needed a day off running as I've been very busy at work since returning from the US. This week has been less hectic but still tiring. Mild, sunny. 29 Jul 12 1pm out/back Melrose River to Calwell, north on track near Cooma Hwy. 66:24 (5:32/km) trying to keep HR under 150. Ave HR 148 (90%) Max 152. Mild, sunny. 30 Jul 7.5 Race: Masters' Handicap Mt Taylor short course. 51st, 3.5k in 17:13 (4:55/km). Ave HR 158 (96%) Max HR 162. Started with Neil but got left for dead. Hard. Mild, sunny. Week 30 47k - A good build-up week. Tired and not fit for racing. 31 Jul 13.2 Speedygeese. 7k warm-up run with Geoff before the session (5:55/km). Tired. Ran the 98m hills easy but stopped after eight as right heel was hurting. Cool, cloudy. 1 Aug 2.5 Calwell. Did the warm-up run with Karen in 16:10. Felt OK. Heel wasn't sore but decided to give it another day away from hard running. Cold, breezy. 2 Aug nil Tired. Slept for an hour and a half when I got home then turned on the computer. Should have run first. Cold. 3 Aug 8 Track, Calwell. 2.5k warm-up alone in 14:46. 1k around ovals in 4:54. 4 x 500m in 2:08, 2:07, 2:07, 2:03. Walk recovery in 1:45. Max HRs 158, 160, 161, 163. Recovery HRs 106, 112, 114. 2.5k warm-down with Kathy in 13:55. Cool, still. 4 Aug 11.4 5.23pm. Melrose River to bridge then up track, back on highway (dark) trying to keep HR under 140. 66:04 (5:48/km) Ave HR 137, Max 143. Nearly everything hurt except for knees and teeth. Cool, breezy. 5 Aug 8.9 Race: CCC Deeks 'Forest'. Ran 2.9k event as warm-up in 16:41 and felt like a really old man. The 6k 'jogalong' race was better, but still bad. Blew up after 3k in 14:40. Finished 91st in 32:41 (5:27/km), Ave HR 153, Max 158. Sunny, warm, still! 6 Aug 4.8 5pm after Fadden Pines (Marty Dent presented the awards and was fantastic with the kids). An easy run with Geoff through and around the pinus radiata plantation. 30:06 (6:16/km). Needed this. Cool, sunny. Week 31 49k - "The City to Surf wasn't meant to be easy" - Malcolm Fraser. 7 Aug 12.7 Speedygeese. 7.2k around Central Basin with Geoff, Trevor in 40:48 (5:40/km). Ave HR 137. Felt good. Started hills but stopped and ran easily on flat grass as both achilles hurting. Mild to cool, still. 8 Aug 5.7 Calwell. Measured a variation of the 750m loop (752m). 2.45k warm-up with Karen (6:20/km). Drills. 2.5k warm-down with Kathy in 13:05 (5:14/km), fast but legs/breathing OK. Full moon. Warm to cool, still. 9 Aug nil Busy at work. Got home feeling guilty about not updating my wordy blog due to reminders from Geoff and Susan. Wrote an opening paragraph. Edited photos, but still too many. Will finish this tomorrow. 10 Aug 2.5 Calwell. 2.5k warm-up in 14:40 (5:52/km) - Ave HR 132. Drills. Left knee felt a little strange but improved in the second half. Warm to cold, still. Great sunset. 11 Aug nil Drive to Sydney, leaving after work 4pm with Gordon, Alisa and Azim. Cool then mild. 12 Aug nil A rest day. 13 Aug 15 Race: The City to Surf. 14k in 73:20 (5:14/km). 73:23 on watch. 6,058th. Very happy to be sub-75 and stay in the 'A group' for next year. Splits: 1k 5:18, 3k 15:11, 5k 25:53, 7k 38:37, 10k 53:52. Well paced and felt in control except for a bad right calf cramp in last 200 metres. AHR 152 Max HR 159. Forerunner said 14.25k from the start line in 73:07. Cool then warm and sunny (perfect). Week 32 36k - Never thought a 73min C2S would be so hard. 146km last 4 weeks. 14 Aug nil Right calf was still a little sore. Not comfortable walking. Mild, sunny. 15 Aug nil Have come down with a head cold. Noticed it first on Sunday evening. Calf improved. Mild, sunny. 16 Aug nil I still have a cold. My calf seems fine walking around so that's good. Mild, windy. 17 Aug nil My cold is a little better. I went down to Calwell and helped Mike with the 'sprinters' as Karen wasn't there. Mild then cool; windy. 18 Aug nil I was hoping to run but got stuck on the computer then had to shop for Joy's birthday present. Mild, sunny, breezy. 19 Aug 4.8 An easy 'long' warm-down with Aki after the Dunrossil Drive cross country races in 29:45 (6:12/km). Ave HR 148. Right calf progressively got worse during the run:( Painful walking afterwards. Warm, sunny. 20 Aug nil Calf is still sore when walking around. Cold early then warm and sunny. Week 33 5k - My calf injury is much more serious than I first thought. 21 Aug nil No running for me at Parliament House today. My right calf is still sore (the main spot is lower down on the inside). Mild, sunny. 22 Aug nil Went down to Calwell but didn't run, just helped with the kids. I've been using Voltaren Emugel on the injury; seems to be helping - could almost walk normally this afternoon. Cloudy, breezy, cool and a sprinkle of rain. 23 Aug nil The calf (soleus actually) has improved to the point where I can walk around almost normally and without thinking about it. Sunny, breezy, cool. 24 Aug nil Went down to Calwell - only 3 there as many are going to Tassie for National Cross Country. Calf pretty good but I'm being extra careful with this one. Cool, cloudy. 25 Aug nil The calf felt OK when I ran across the road today. I should try a short easy run tomorrow. Freezing (9C at 3pm) and wet. Snow at Corrin Forest. 26 Aug 3.84 Race: CCC 'The Pinnacle' 4k. 21st in 24:21 (6:20/km). Ran steadily and walked the hills to ease pressure on the calf. Splits: 5:33, 5:57, 6:58, 5:50 (840m) AHR 146 Max 153. Quite happy - Soleus was OK. Other things hurt (hamstrings, quads, lungs) due to rustiness. Mild, sunny, still. 27 Aug 5 Calwell 4pm. Ran 5k on the track trying to keep HR under 140 (85%). 30:03 (6:00/km) Splits: 5:56, 5:51, 6:01, 6:03, 6:12. Ave HR 142 Max 144. Calf is not good. It was niggling throughout; like it could have gone at any moment. Sore walking afterwards. Not happy. Mild, cloudy. Week 34 9k - Not happy as the calf problem is still hanging around. 28 Aug nil Calf was sore today - I had to walk slowly and with care to avoid aggravating it. Mild, sunny, still. 30 Aug nil Still walking like John Cleese. Mild and partly cloudy. 31 Aug nil Walking has improved and is not so silly looking. Went down to Calwell; Quite a variation in how the kids handled a strength session. A beautiful day. 2 Sep nil Walking is fairly normal. I'm able to lightly stretch the calves. Watched the last race of the cross country season - the relays at Yarralumla. A ride on the GSX in the afternoon. Warm, sunny. 3 Sep nil The calf was feeling okay, so in the afternoon I went for an easy walk around the lake. 'About' 5k in 'about' 46 minutes. Mild, sunny and windy. Week 35 0k - I'm pleased with how the injury is progressing. 4 Sep nil The calf seems okay - just occasional feelings of slight tightness. Walking is fine. Mild, sunny, still. 5 Sep nil I feel like I could run but I don't want to risk it. I need to be patient with this injury. Cool and fine. A beautiful sunset over the Brindabellas. 6 Sep nil I was happy the calf was being less talkative today. Busy at work, so no time afterwards even for a walk. Cool, late rain. 7 Sep nil Only one or two complaints from the calf during the day. It was bloody freezing down at Calwell! Glad I wasn't running. Very cold and windy. 8 Sep nil Quite happy as there were no wayward signs at all from the calf today. Cool, sunny. 9 Sep nil An easy walk around Central Basin LBG, 5.2k in 49:10 (9:27/km). No problems with the calf but my left hamstring and quad were having a conversation. Cool and windy. 10 Sep nil Still not running. Legs felt okay today. Visited Joy and Mal to check out their new car. This has been my smallest month of running since the 1990s. Week 36 0k - The injury seems okay. 14km last 4 weeks. 11 Sep nil I was tossing up whether to try something this afternoon but tiredness after finishing work convinced me otherwise. Cool and breezy. 12 Sep 2.5 Calwell. My first 'run' back. Did the warm-up with Karen alternating 60secs jogging and 60secs walking. 17:31 (7:01/km). I was very pleased there were no problems at all with the calf. Both hamstrings were a little tight. Core strength exercises. A beautiful afternoon - warm and sunny. 13 Sep 4.2 5.40pm. Alternated 75 seconds running and 45 seconds walking. 4.2k in 27:20 (6:30/km). Running bits were about 5:30/km. Thankfully the calf was fine. Legs otherwise were a bit stiff. Tried to run with good form but it was an effort. Fairly happy with the run. Warm and fine - 18C. 14 Sep 2.5 Calwell. The 2.5k warm-up by myself alternating 90 seconds running and 30 seconds walking. 16:08 (6:28/km). Calf fine, but a little general leg soreness from yesterday. Regaining fitness will take a while. Warm and fine. 15 Sep nil I thought a day off wouldn't do any harm. Had a busy day at work so it would have been pushing things a bit to 'run tired'. Another beautiful day. 16 Sep nil Drove to Sydney, picking up Luckylegs in Mittagong on the way. Went for a walk with Bruce in the afternoon (about 5k), through Neutral Bay, up to North Sydney Oval and back to Milson's Point. Warm, sunny. 17 Sep nil Walked over the Harbour Bridge to the Domain to watch Blackmores 9k. A good run from LL - 57:51 net (6:26/km). Watched until the 3:45 pacer in the marathon came past (saw Nick Mesher at about 3:15 pace), then walked back to the Vibe. About 7k of walking. Warm, sunny. Week 37 9k - Happy to be back training. Calf seems fine. 18 Sep nil I was planning to run but it didn't happen. Dinner with Geoff's group. Warm, sunny. 19 Sep 4.1 Calwell. My first runs without walking breaks. The 2.5k warm-up by myself in 14:57 (5:58/km). After training, the 1.6k warm-down in 8:40 (5:25/km). Calf was OK :) Very slight hamstring soreness. Warm, windy. 20 Sep 6 From PH with Chris; joined George and Cathy from Comm Bridge. Started losing the group on Kings Ave Bridge. Stopped at Reconciliation Place and walked back to PH. First 3k was good. 33:43 (5:37/km). AHR 147. Slight niggle outside left ankle. Legs a bit tight. Cool and windy. 21 Sep 2.5 Calwell. The warm-up run in 14:48 (5:55/km), last 500m in 2:35. Found it a bit quick for warm-up pace. Legs were OK. Ankle better. Mild, sunny and windy. 22 Sep nil Felt tired after a big day at work. Planning to try and run 10 kilometres in the morning. Warm and very windy. 23 Sep 11 LBG. 1k warm-up jog. Wanted to run 5k out/back at a solid pace. Started from Comm Bridge, north side of lake and ran to Duntroon with a tail wind. Calf started tightening a bit just before the turn so I stopped at 5k in 25:36 (5:07/km) - AHR 157 (95%), Max 162. Jogged slowly 5k back to the car in 33:57 (6:47/km) - AHR 140 (85%). Calf wasn't too bad walking later in the day but the left groin is sore. Sunny, mild, windy. 24 Sep nil Decided to have a day off running - a bit worried about how the calf acted up yesterday. It was fine walking around the shops today so I'll do Speedygeoff's warm-up for the warm-up tomorrow afternoon. Winter-like; cool, windy. Week 38 23k - Fairly happy. Ran too hard on Saturday. 25 Sep 7.6 From Parliament House with Geoff and Alan for a long warm-up. Ran down to the lake, one lap clockwise and back to PH in 45:27 (5:59/km). Was careful, trying to be smooth and using all of my feet. Thankfully, no tightness at all in the calf. Struggled with breathing. Great to be running :) Mild (14C), sunny and breezy. 26 Sep 2.5 Calwell. The warm-up run with Karen and Ben in 15:45 (6:18/km). With great difficulty, Ben managed to run this slowly. Did some drills but nothing else. The calf felt OK. Cool, fine and breezy. 27 Sep 9.4 From PH with Chris - met George and Cathy at Comm Bridge, around Central Basin then back to PH via Lennox Gardens in 54:03 (5:45/km), AHR 150 (91%). Better than last week but still couldn't keep up. Slight feeling in the calf which improved during the run. Had a good day at Bowral watching CB run on the grass track at Chev. A lovely late lunch at Gilberts in Mittagong. Warm (19C), perfect. 28 Sep 1.5 Calwell. The short warm-up around the ovals in 8:44 (5:49/km). Happy as there were no problems at all with the calf. T-shirt weather. Another perfect, warm afternoon. 29 Sep 7.6 Race: Customs Joggers 5k Handicap. Floriade course - hilly 5k in 27:13 (5:26/km), AHR 157 (95%). Splits 4:48, 5:51, 5:18, 5:32, 5:32. Happy as the calf didn't moo. Headwind out. Finished well back - swamped by faster runners including Allrounder on last hill. Didn't catch sight of Flashduck who had a good run. Warm, fine and windy. 30 Sep 12.4 Long run. Carillon to Anzac Pde, War Memorial, clockwise lap of Mt Ainslie. Legs felt like rusty steamroller wheels. Stopped at the War Memorial - 12.4k in 81:20 (6:34/km) - walked back to the car. AHR 143 (87%), Max 150. Being unfit isn't fun. A lovely day - warm, fine, still. A pity South Melbourne lost by a point. 1 Oct nil Dusted off the road bike. Cycled around Tuggeranong late in the day. 28k in 69:47 (24.0 kph). Quads felt it a bit. Weak on hills. Bike wasn't comfortable - fit needs adjustment and seat felt hard after the mountain bike. Rear gear change dodgy. Nearly fell off when I was late getting my foot out of the pedal. Fine, still, sunny. Week 39 41k - A better week although the long run was very ugly. 2 Oct 9.5 Speedygeese. A select group. Trev ran on the grass. Chris, Alan and I ran around Central Basin (long) in 56:36 (5:57/km). Kept dropping off the back. Legs felt OK but breathing not. Earlier in the day I rode 17.2k at 25.0 kph, AHR 120 (73%). Flat rear tyre near Hume which took 15 minutes to fix. Cool and windy. 3 Oct 9 Mallacoota, VIC. 1.7k warm-up. Time trial out/back on Pipeline Road (a good gravel road). A hill after half-way turn at the gate. 5.7k in 29:58 (5:15/km). Ave HR 154 (93%), Max 159. My best sustained run since May 27. Jim paced me on the mountain bike. 1.6k warm-down. Fine and warm. 4 Oct 10 Mallacoota, VIC. 4.40pm. A long 'easy' run. Pipeline Rd, then left on a little used bush road to the Casuarina walking track (similar to the Lane Cove bush track). Back via Mallacoota Inlet and the foreshore caravan park. 63:48 (6:23/km), Ave HR 135 (82%). Very tired last 3k. Warm and breezy. 5 Oct 6 Track, Calwell. 2.5k warm-up 15:33. Drills. 5 x 200m in 53.7, 49.3, 46.3, 47.0, 46.6, 47.4. Couldn't keep up with Karen. 2:15 walk recoveries. 2.5k warm-down in 15:40. Really found these difficult! Worried about the calf but it was OK. Fine and warm. 6 Oct 6.5 Race: Customs Joggers 5k Handicap. Course PB by 13 seconds - 27:00 (5:24/km). AHR 153 (93%), Max HR 163. Started with Bob and Colin but lost them after 1k. Splits: 4:59, 5:27, 5:28, 5:36, 5:30. Breathing was more comfortable than last week, but both calves (even the 'good' one) were a little niggly. Warm and breezy. 7 Oct nil A rest day from running. Bought a new seat and tyres for the road bike. 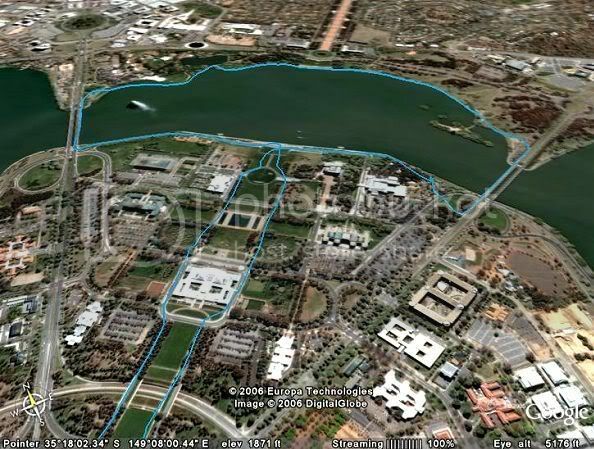 Cycled a lap of Lake Tuggeranong - 24.3k in 59:50. Calf hurt a bit on the few occassions I got out of the seat. Fine and warm. 8 Oct 12.2 Long run. 1pm, ran down Melrose River to bridge then up dirt track to Gilmore and back in 74:29 (6:06/km). AHR 143 (87%), MHR 148. Wasn't running smoothly - the right calf was niggly but didn't get worse during the run. Right shin sore during the first half. Mild, sunny and very windy! Week 40 53k - Too much? The calf is sore again. 126km last 4 weeks. 9 Oct nil The right calf was uncomfortable walking to work this morning. Had to walk flat-footed and couldn't use my toes. It improved during the day. This afternoon I went for an easy 30 minute ride on the mountain bike - saw Val and Robyn out walking. Cycling is fine if I stay seated. Sunny, cool and breezy. 10 Oct nil Rode the mountain bike down to Calwell. The calf has improved. Walking is smoother but I have no confidence to try the hopping drills that Karen was doing. I'll try a light run on Thursday. Warm and sunny. 11 Oct nil Still a little 'feeling' in the calf with some foot positions. Rode the mountain bike 'hard' for 1 hour 20 minutes mainly on bike paths. Tried to use a quick cadence. Not strong enough to push big gears. Ave HR 109 (66%). MHR 123. Felt it a bit in the quads. Fine and mild. 12 Oct 5.5 Calwell. 2.5k warm-up by myself in 15:54 at ave HR of 135. Slow Race Test: 3000m on track with the aim of keeping heart-rate steady all the way: Ave HR was 138 (84% of maximum), time was 18:16 - km splits 5:54, 6:14, 6:08. I'll use this as a future test to measure improvement. It's an understatement to say I'm pleased there were no calf niggles at all. Warm, a light breeze and sunny. 13 Oct nil Mountain bike. Mainly on bike paths around Lake Tuggeranong and back via Banks. 23.9k in 71:45 (20kph). Ave HR 110 (67%), MHR 127. Felt OK although a bit tired from a long day at work. Fine and warm. 14 Oct 10.2 Long run. Two laps of Central Basin LBG in 60:45 (5:57/km). Before starting I wanted to keep my heart-rate between 140 and 145. Ave HR 143 (87%), MHR 146. This effort felt 'solid'. The calf behaved but I was very careful to run smoothly and slow down on the miniscule uphills of this course. Luckily there was a cool change when I started but it was still about 25 degrees. Warm and cloudy. 15 Oct nil Mtn bike. 5.45pm. Isabella Plains, Bonython, back via Macarthur & Gilmore trails. 22.8k in 76:06 (18kph). Tough as much of the second half was uphill into a fresh easterly breeze. Ave HR 112, MHR 131. Cool and windy! Week 41 15k - Feeling OK about the calf situation. Small steps. 16 Oct 10.8 Speedygeese. Early with Geoff for a 'long warm-up' but he had to bail out with a sore calf! Is this injury contagious? Ran alone, then the normal group warm-up which included Mick Horan who I hadn't seen for a while. 10.8k total in 68:20 (6:20/km). Ave HR 133 (81%). Felt easy and good. No calf problems :) Cool and windy. 17 Oct 2.5 Wanted to go for a longer ride but had a tiring day at work. Just cycled to and from the grass track at Calwell. Good to see Ben and Al back. Ran the long warm-up run with Karen easily in 16:30. The calf was OK. Felt strong on the short bike ride home. Cool, breezy. 18 Oct 11.7 From PH with Chris to Constitution Ave, Blundell's, Comm Bridge, Gallery, Yacht Club in 68:42 (5:52/km). Ave HR 145 (88%). Happy as I ran without thinking too much about the calf. Felt good. Mild and breezy. 19 Oct nil Strangely, the calf was sore this morning (when it didn't hurt at all during the run last night). The pain eased during the day. Kathy said this was 'normal' and nothing to worry about. Rode the Apollo to and from Calwell. Fine and warm - a perfect afternoon! 20 Oct nil Calf not good enough for running. Only had time for a short easy mountain bike ride - 7.2k in 31 minutes (14kph). Ave HR 97. I'd like to do another 10k run on Saturday or Sunday. Fine and mild. 21 Oct 6 2pm. Almost didn't happen. Not sure about running because there was still some feeling in the calf. No problems during the run! Both sides of Melrose River in 33:46 (5:38/km). Ave HR 150 (91%). Fairly hard - fastest km 5:14, slowest 5:58. Faded in the second half. Cool and breezy. 22 Oct nil A late afternoon mountain bike ride. Rode 24.7k 'hard' in 63:30 (23.3kph), down to Lake Tugg then around Gordon and back to Calwell on bike paths. Ave HR 126, MHR 140. Fine and mild. Week 42 31k - A good week. Happy with Saturday. Weight 79.5 kg. 23 Oct 9.4 The early warm-up at Speedygeese - around Central Basin, 7.6k in 45:30 (5:59/km). Ave HR 140, MHR 151. Quite tired. Struggled to keep up. Normal warm-up 1.8k in 10:44 (5:44/km). Calf good :) Fine and mild. 24 Oct 2.5 Calwell. Rode the mountain bike down. Kathy talked me into doing the warm-down run. 2.5k in 13:24 (5:22/km). For me, this felt quick, but for her it was a crawl. Calf good :) Fine and warm. 25 Oct 11.7 From PH with Chris, then with Cathy and Graham around Central Basin, 11.7k in 69:11 (5:55/km). Forgot watch part of HRM! Felt better than last Wed, although some sections hard. Calf good :) Fine and warm. 26 Oct 2 A warm-up run with Luckylegs at the AIS track before her 800 metre race. I want to do more running and regain confidence in the calf before racing on the track. Warm then cold! 27 Oct nil Didn't have time to ride the mountain bike after work as I had to shop for a birthday present. Mild and windy. 28 Oct 4 At Interclub. 'Warm-up pace' running within the grounds of the AIS track for 26 minutes with a rest in the middle. The calf was good. Times in the 3000m race ranged from 8:48 to about 12 minutes. Jim's friend Kale ran 9:03. Kathy ran 10:50 again. Mild and windy. 29 Oct 12.7 Sunday long run. At 8:00am: Fadden Pines up to the hills, including Mt Wanniassa with Geoff. Did the steep bits in neutral (walking). Tired due to the early start (daylight saving). Very happy as the calf didn't moo at all. 86:50 (6:50/km). Ave HR 133 (81%) MHR 141. Cool and sunny. Week 43 42k - Another good week. Keep building. Weight 79.0 kg. 30 Oct 11.8 Speedygeese. Early warm-up run around Central Basin, 7.8k in 44:45 (5:44/km). Ave HR 143. Felt better than last week. Calf good :) Then normal warm-up plus 'a bit' for 4k at 6:20 pace. Warm, sunny. 31 Oct 5 Calwell. Ran the 2.5k warm-up, and after training, the warm-down, keeping average HR at 130 (79%), not looking at the watch. Times were 15:15 and 15:02, so 40 to 50 seconds quicker than October 12 for a lower HR (135 then). A small improvement in fitness :) Warm and sunny. 1 Nov 12 From PH with Chris - Central Basin, Yacht Club, Embassies in 69:55 (5:50/km). Ave HR 140 (85%). A bit of a struggle, especially the hilly finish. Calf good but niggle in medial tendon behind right knee. Warm, sunny. 2 Nov 4.4 Calwell. 1.4k warm-up with Ella. After training, did a Slow Race Test - ran 3000m on the track keeping the average HR at 138 (84%). Time was 16:57 with km splits - 5:26, 5:41, 5:50. Very happy as this was 1:19 quicker than when I last did it on October 12. Mild and stormy. 3 Nov nil Nothing. Wanted to ride the bike for an hour or so, but a rare storm brought welcome rain. As it was, I was pretty tired from recent late nights and a big day at work. Long run in the morning! Mild and wet. 4 Nov 18.2 Molonglo 7am. Ran to Mt Majura via Trent's grave hill, back via zig-zag track and War Memorial. Mainly with Steve, John and CJ. Broke run up with three slow walks totalling 67 minutes. 18.2k running in 1:53:28 (6:14/km), Ave HR 142. Felt OK although slowed in the last 3k. Cool, cloudy and humid. 5 Nov nil Rode the mountain bike fairly hard around Lake Tuggeranong and back. 19k in 52:18 (21.8kph), Ave HR 106. Tailwind out saw kms in 2:10 which were 3:30 on the way back! Mild, sunny and windy. Week 44 51k - Happy with long run & 'SRT'. 78.0kg. 139km last 4 weeks. 6 Nov 14.5 Speedygeese. Early long warm-up to Mugga Way and Canberra Grammar School. Normal warm-up and 'Rose Garden' fartlek session 'steady'. Total 87:24 (6:02/km). Ave HR 140. Overcast, cool, breezy. 7 Nov 6.4 Calwell. After training, ran a loop via Richardson up to Gilmore track in 39:46 (6:13/km). Just going through the motions. Too tired to get the HR up. Ave HR 129 (78%), MHR 138. Cloudy and cool. 8 Nov 11.1 From PH with Chris. Around Central Basin via Constitution Ave and Nara Peace Park in 60:10 (5:25/km). Ave HR 137, MHR 142. Although the pace was 'quick' I was able to keep up. The best I've felt since first injuring the calf at the City to Surf. Almost as good as LL's run! Fine, cool and windy. 9 Nov 5.5 Calwell. Slow Race Test - 3000m at Ave HR 138 in 16:51. Splits: 5:26, 5:41, 5:44. Start HR was 125. Better than last week as I ran the 'warm-down' with Kathy, Siobhan and Ben just prior to the test - 2.5k in 13:29 (5:24/km), Ave HR 139. Also shows the grass track is quite slow for distance runs. Fine and mild. 10 Nov 6.1 6pm. A loop down Melrose River and back via Calwell High. Wanted an easy run, so as an experiment, I kept the HR at an average of 118 (71%). It was very difficult running this slowly - had to ease off on the moderate hills to keep the HR down. 39:30 (6:28/km). Fine and mild. 12 Nov 3.2 Stopped at Calwell track during an easy 12k mountain bike ride. Slow Race Test in the Frees. Thought light shoes might produce a quicker time, but it was a bit breezy. 3000m at Ave HR 138 in 17:01. Splits: 5:29, 5:44, 5:48. Start HR 122. Some strides to warm-up. Legs OK. Mild and windy. Week 45 65k - A good week, but the long run was hard. Weight 77.0kg. 13 Nov 14.3 Speedygeese. 6k warm-up with Geoff, Trevor on PH tracks. Normal warm-up + 30min 2-person relay (with Ruth) running '400m' hard, '220m' jog. Ran moderately with two harder HR 150 efforts. Felt OK. Sunny but windy. 14 Nov 5 Calwell. About 15 minutes of 'forwards/backwards drills'. 2 x 2.5k warm-downs - first with Karen, second with Kathy, Tom and Daniel. About 29:40 total for the 5k. Very tired today! Sunny and windy. 15 Nov 10.6 From PH with Chris. Central Basin via Constitution Ave, Nara Peace Park in 59:15 (5:35/km). Didn't run the extra bit at the end. Ave HR 139. Felt good, with something in reserve. Cold and windy (snowed earlier). 16 Nov 5.5 Race: Masters' track. 3000m in 14:08.14 Splits: 4:46, 4:45, 4:37. Ave HR 152, MHR 158. Last minute decision to run (no warm-up). 1000m walk in 5:28.05 Good race by Norma in the 1500m - 8:24.65. Cool and breezy. 17 Nov nil Went out for a celebratory meal at Belluci's in Dickson (footpath dining) with Luckylegs, Flashduck and PPRB. After her good 1500 on Thursday, LLs ran the Customs 5k in 31:08, a PB! Perfect weather and company. 18 Nov 19.4 Molonglo 7:07am. To Mt Majura '4-ways' via Trent's Hill, back via west side Mt Ainslie and Duntroon in 2:11:49 (6:48/km), Ave HR 132 (80%). Tired. Struggled 2nd hour. Tripped on a rock and fell over. Right heel a little sore in the last 6k. A glorious morning - fine and mild. 19 Nov 11.6 11:48am. Easy from PH to see World Long Course Triathlon Champs - some of the bike and run legs. Flash Drake 2nd M55. I ran 5 sections - total 66:10 (5:42/km). Fastest km 5:12, slowest 6:20. Very warm and breezy. Week 46 66k - Highlight - Norma's good 1500m race. Weight 77.5kg. 20 Nov 14.7 Speedygeese. 6.5k warm-up + normal warm-up. 2 person relay: 600m 'hard' with 300m jog recovery. Ran fairly hard first 3, but eased off as my right heel started hurting. 5:55/km ave for session. Warm and humid. 21 Nov 5.7 Track, Calwell. 2.5k warm-up in 13:53 (5:33/km), Ave HR 134. 5 x 100m in 22.1, 21.8, 20.8, 21.9, 21.6 plus 1 x 150m in 32.9. With Karen who was running 200s. Frees. Heel was OK during this. First track session since the calf injury. Felt OK. 2.5k warm-down in 13:57. Hot and windy. 22 Nov 11.1 Central Basin from PH with Chris, via Constitution Ave, Nara Peace Park in 62:12 (5:36/km). Ave HR 141. Fastest km 5:17, slowest 6:05. Injuries OK, but struggled with tiredness and lack of energy. Warm, windy. 23 Nov 8.3 Track, Calwell. 2.5k warm-up 15:03, AHR 129. 2 sets 6 x 150m, 1:20 walk recovery. 34.9 32.6 34.1 32.9 33.7 32.5 / 33.1 32.9 33.5 32.4 32.9 32.5. Frees. 2.5k warm-down 14:56. At Masters: 1500m race walk in 8:09.77 (1st). Lap-scored Kathy's ACT W50 record 10,000 - 39:07! (19:16/19:51). Fine and warm. 24 Nov nil Went straight from work to help at the SCT Golden Mile. Nicola Torley won the junior race in 6:08, Alan McGlew the open in 5:10 and Friar the handicap in 8:40. A good event! Fine and warm. 25 Nov 16.4 Molonglo 8:02am. Ran with 'short' group, second half with Strewth and Barbara. Mt Ainslie clockwise in 1:46:25 (6:29/km). No hills. Ave HR 129, MHR 142. Felt good (easier early pace helped). Warm, 22C. 26 Nov 6.2 1.10pm: Race: Interclub 3000m. Finished last in 13:28.37 (4:29/km). Splits: 4:21, 4:32, 4:35. Ave HR 156 (95%), MHR 160. Felt tired. Warm - 29C and windy. 6.30pm: Calwell, Slow Race Test. 3000m at Ave HR 138 in 16:35. Splits: 5:20, 5:38, 5:38. Frees. The warm-down I didn't do after Interclub as it was too hot. Best time for this test. Mild, cool easterly. Week 47 62k - Happy to be doing speedwork & racing. Weight 77.0kg. 27 Nov 15 Speedygeese. 8.5k warm-up around Central Basin, 51:13 (6:02/km) at Ave HR 130. 600m loops at PH with 600m recovery - I did all at a steady, easy pace, 7.5k. Tired. Hot, with a cool breeze later. 28 Nov 5.5 Track, Calwell. 2.5k warm-up with Karen in 15:34. 2 sets 4 x 200m, 1:35 walk recovery, full recov between sets. 46.1, 44.1 , 45.6, 41.5 / 43.3, 41.4, 42.1, 41.6. Frees. Happy with this. About limit of current speed while maintaining good form. No injuries. 1.4k warm-down in 9:12. Hot, windy. 29 Nov 12.3 7.15pm. Out/back from Theodore to Clive-Steele Ave, Monash in 68:02 (5:32/km). Ave HR 137, MHR 141. Surprised at low HR for this pace. Fastest km 5:10, slowest 6:02. Cooler, 17C, windy. 30 Nov 4 Calwell 4:15pm, Slow Race Test. 3000m at Ave HR 138 in 16:17. Splits: 5:15, 5:29, 5:33. Frees. Another PB for this - felt good. Later, at Masters' Track: 1000m race walk in 5:29.52. (1st). Another PB for LLs in the 1500m - 8:15.43 (4:18 at 800m). Fine, mild, slight breeze. 1 Dec nil Was planning a short run before meeting Luckylegs, Speedygeoff, Mrs Speedygeoff, PPRB and Aki for dinner. Fell asleep after work and ran out of time. Dry and hot. 2 Dec 13.1 Gilmore Tunnel to Railway out/back in 76:42 (5:51/km). Splits: 40:38/36:04. Ave HR 139, MHR 148. Slept in - didn't have time to drive to Molonglo. Felt OK. Fine and mild. 3 Dec 13.1 Out/back from home to Gowrie via Ashley Drive (50% dirt). A lumbering second half (stomach upset) after 36:12 at half way. 75:54 (5:48/km). Ave HR 134. Cool and windy. Week 48 63k - A good week. Weight 77.5kg. 256km last 4 weeks. 4 Dec 13.5 Speedygeese. 4k early warm-up by myself. Session was 8x350m with 350m jog, although I ran all at a moderate pace. 1.2k warm-down. Average 5:56/km, Ave HR 136. OK except niggly right heel. Fine, mild. 5 Dec 7.2 Track, Calwell. 2.5k warm-up 15:24. 2 sets of 6/5 x 200m, 1:20 walk recov, 10min between sets. 43.9, 42.8, 42.4, 43.0, 42.1, 41.5 / 42.8, 41.1, 42.3, 40.6, 41.5. (42.2 ave = 3:31/km) Frees. Hard, but felt OK. 2.5k warm-down 16:05. Sore left neck, shoulder upon waking and all day. Fine, warm. 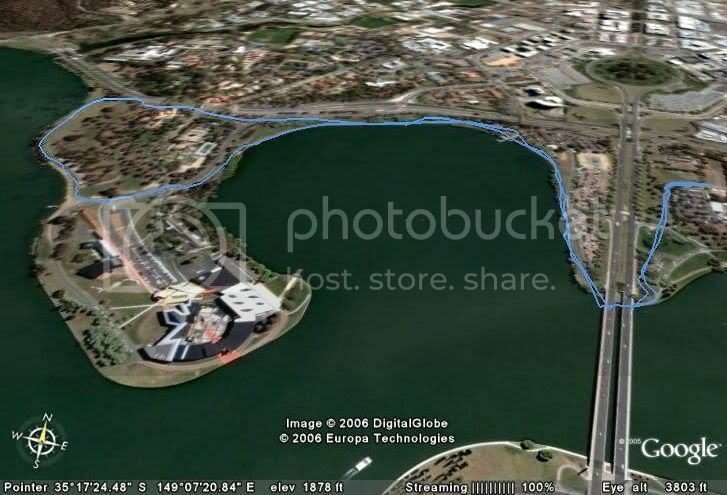 6 Dec 11.1 PH - Central Basin with Chris, via Constitution Ave, Nara Park in 63:36 (5:44/km). Very tired. Strong headwind from Kings Ave. Ave HR 139. Neck improved during the day. Warm, then cooler. Windy! 8 Dec nil A rest day prior to a long run with Steve's Molonglo group - 7am in the morning. Need a good night's sleep as I've been quite tired this week. Hot and smoky (from the Victorian bushfires). 9 Dec 24.2 Molonglo, 7.08am. Over Mt Ainslie first, then Trent's Grave Hill to horse stile. Left others (Steve, John and Cathy) in Majura Pines and hiked up to '4-ways'. Rested, then back via zig-zag and War Memorial. 2:35:12 (6:25/km). Ave HR 137. Tired last 5k - a 6 min/km shuffle. Fine and warm - 16 to 21C. 10 Dec 10 Recovery run (low HR). Out/back near 'Melrose River' and around Tuggeranong Homestead in 60:55 (6:06/km). Ave HR 128, MHR 135. Legs felt good, no injury niggles. 7.30pm, hot, still and smoky. Week 49 71k - Track session and long run went well. Weight 76.5kg. 11 Dec 14.8 Speedygeese. 7.5k early warm-up around Central Basin. Session was 8 x 'short' hill circuit from Rose Gardens. I ran everything at an easy pace. Ave HR 131. 95:20 (6:26/km). Hot, windy, smoky. 12 Dec 2 Race: Parliament House Relays. Decided late to run for our 'B-grade' team. 200 metre jog warm-up. Leg 5 - 1.77k in 7:57 (4:29/km). Slow start - first km in 4:38. Felt OK. Cool and windy. 13 Dec 16.4 From PH with Chris; met Cathy and Graham for a lap of Central Basin, back to PH, then I ran reverse alone. 93:45 (5:43/km), AHR 134. Felt OK, although tired. Warm but a cool breeze. 14 Dec 7 Track, Calwell. 2.5k warm-up with Karen, Kathy in 14:42. 2 sets 5 x 200m, 1:30 walk recov, sometimes longer. 44.9, 46.4, 45.6, 44.3, 43.8 / 43.3, 43.7, 42.5, 44.3, 43.5. (44.2 ave = 3:41/km). Frees. Legs didn't want to do this. Backed pace off to keep form. 2.5k warm-down with group (12) in 14:35. Warm, windy. 15 Dec nil Didn't feel well in the morning but improved on the drive to Katoomba. Stopped for lunch at Gilbert's in Mittagong with Luckylegs. Mild and very light rain during most of the drive. 16 Dec 5.8 3.30pm. During a break in the rain, ran from Lyrebird Loft to the Explorers' Tree, down Nellie's Glen and a little bit on the fire trail with Jen, Chris and Josh. All the steps (497) were walked in both directions. Garmin said about 320 metres of vertical climb. Overcast and humid. 17 Dec 10.5 10.15am. Hiked from Megalong Valley Rd to Bowtell's Swing Bridge and return (12.5km). On way back, stopped by a large Goanna slowly moving along the trail! Warm and sunny. 7.45pm. Driving home, parked at PH. Slow past Chinese Embassy to lake, around Central Basin, back via Old Parliament House, 64:20 (6:08/km). Ave HR 128, MHR 132. Warm; cooling wind. Week 50 56k - Good to revisit the Six Foot Track. Weight 76.5kg. 18 Dec 13.7 Missed PH due to work. 7.30pm, down bikepath to Monash lake, back via Bonython, Calwell hill - aiming to keep HR under 130. 85:17 (6:14/km). Ave HR 128, MHR 135. Warm, still. 19 Dec 7.5 Track, Calwell. 2.5k warm-up 15:26. 6x80m easy. 4 x 500m, 2min walk recov - 2:03, 2:01, 2:00, 2:04. Frees. Left hamstring, glutes niggly. 2.5k in 14:45. Tough conditions. Happy. Very windy. 20 Dec 12.2 From PH with Chris, then Cathy and Graham for a lap of Central Basin including Anzac Pde in 69:10 (5:40/km). Ave HR 137. Although tired, felt OK. Hamstring improved. Cool and breezy. 21 Dec 7.3 Track, Calwell. 2.5k warm-up 15:43. Drills, strides and 2 x 100m. 2 sets 5 x 200m, 1:25 walk recov, 5mins between sets. 42.3, 41.5, 42.3, 41.1, 39.6 / 40.8, 39.7, 40.6, 39.4, 40.5. (40.8 ave = 3:24/km). Frees. Not easy. Had the leg speed of Virgil Tracy. 2.5k warm-down with Kathy, Karen in 15:10. Mild, windy. 22 Dec nil The top of my right foot in front of the ankle is sore. Noticed this yesterday on the warm-down. I've had this niggle before and it fixed itself. Overcast and hot. 23 Dec nil After late Christmas shopping, a cuppa at Joy and Mal's on the way to Wagga. Through heavy rain past Yass. A brilliant crimson red sky in the west as I drove into darkness after Gundagai. 24 Dec nil Slept for 9 hours. Foot still sore walking up and down stairs. Went to the Forum-6 in the afternoon with Mum, my sister Jane and brother Graeme to see Casino Royale. Fine and cool. Week 51 41k - Track improving. Sore foot a worry. No scales at Wagga. 25 Dec nil Foot improved - may have been able to run, but it was Christmas. I had breakfast while the others went to church - Graeme, Catriona, Claire and Nathan (my niece and nephew), Jane and Mum. Afterwards, an extended opening of presents and Christmas lunch. Then playing games, reading, watching DVDs and more eating. Claire became very good at playing 'Hallelujah' on the piano. Fine and cool. 26 Dec 10.2 Drove back to Canberra after seeing Warnie's 700th. Stopped at PH and ran Central Basin via Chinese Embassy in 61:15 (6:00/km) at ave HR 138. Interesting as it showed a measureable decline in fitness after four days off. Before Christmas I was running 5:40/km for this HR. Cool and windy. 27 Dec 16.1 With Chris from PH around East Basin via Wetlands, then Central Basin in 93:22 (5:48/km) Ave HR 144. Hard. Last 4k slowed to around 6 min kms. Cool and windy. 28 Dec 6.2 Track, Calwell. 2.5k warm-up 15:27. Sore lower back. Drills, strides. 10 x 100m, walk back 1:35 recov. 23.5, 22.0, 20.9, 20.6, 20.5, 20.3, 20.3, 20.0, 20.1, 19.0. (20.7 ave = 3:27/km). OK. 2.5k in 15:29. Mild, breezy. 29 Dec nil Visited Joy and Mal in the afternoon so I didn't get to run. It was probably good to have the day off as my lower back was still feeling strange. Mild and stormy. 30 Dec 16.4 Steve's 6' group minus Steve. 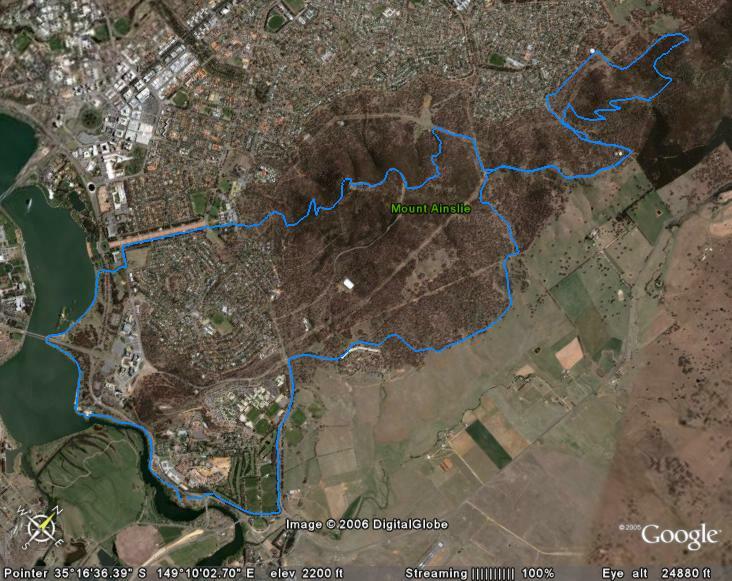 Ran mainly with Maryann, Chris and Graeme - lap of Mt Ainslie via Campbell Park, Ainslie saddle in 98:45 (6:01/km). Ave HR 139, MHR 152. Mild, still, some cloud. 31 Dec 9 Track, Calwell. Ran 2.8k down as warm-up in 15:46 (5:38/km). 5000m time-trial at 'racing' effort in 24:25 (4:53/km). Splits: 4:35, 4:52, 4:58, 5:10, 4:50. Frees. Happy. Made more difficult by a headwind up the back straight. Grass good. Ave HR 158, MHR 163. Start HR 102, going to 156 after 400m, then generally 158 to 160. Lower back niggly on warm-up, but improved. 1k slow warm-down in 6:48. Warm, windy (25C, 22kph). Week 52 58k - A good week. 226km last 4 weeks. Weight 76.0kg. My training diary for 2007 is here. Goals: Sadly, I was only successful at one - finishing Six Foot under the 7 hour time limit. 800 metres - 2:55.70 (over by 22 seconds), 1500 metres - 5:47.89 (over by 34 seconds), 3000 metres - 13:28.37 (over by nearly 2 minutes! ), 5000 metres - didn't race one. High Jump 1.30m (under by 15cm). City to Surf - 73:20 (over by 13:20!). Races: Only 18 races - the smallest number for many years. My best race was in the Canberra Half Marathon Eve 5k road event where I ran 22:30 for 46th place. I placed 675th at the Six Foot Track in 6:56:09. I finished the Nail Can Hill Run in 60:56. My trip to America and Canada interupted my training and racing. I tore a calf muscle in the City to Surf and didn't race seriously after that. Numbers: I ran 2,108 kilometres, an average of 40.5 per week. Last year I averaged 58.6km per week. The biggest month was February with 266km and the smallest August with 14km. There were 141 days when I did not run! I raced 18 times - 4 on the track and 14 'others'. This page is 135kb. Other words: I wasn't happy with how I ran in 2006. I hope to remedy this in 2007. In spite of racing poorly, there were many enjoyable training runs scattered throughout the year.